Granny's Finest fruit tea from TEEKANNE. TEEKANNE World of Fruits is a unique selection of finest fruit teas inviting you to discover a whole new world. Discover granny’s secret recipe for her famous fruit tea! 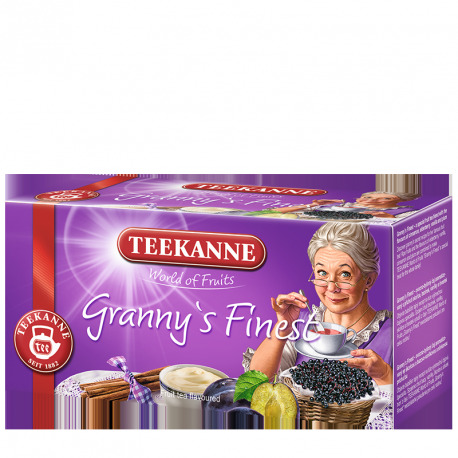 Ripe fruits and the flavours of elderberry, vanilla, cinnamon and plums are combined to make TEEKANNE World of Fruits Granny’s Finest a special treat for the whole family! Pour fresh, boiling water over the tea bag and steep for 8 minutes. We recommend using 1 tea bag per cup. Sweeten to your taste. Flavoured fruit tea blend with cinnamon, plum and vanilla flavour.